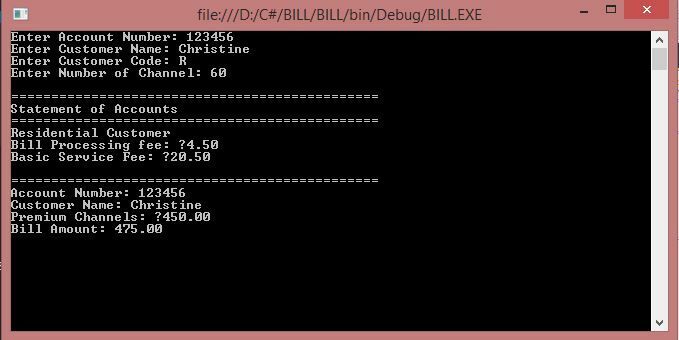 Create a program that calculates a customer’s bill for a local cable company. There are two types of customers: residential and business. There are two rates for calculating a cable bill: one for residential customer’s and one for business customers. The program should ask the user for an account number (an integer) and a customer code. Assume that R or r stands for a residential customer, and B or b stands for a business customer. The purpose of this program is to calculate and print the billing amount. To calculate the billing amount, you need to know the customer for whom the billing amount is calculated (whether the customer is residential or business) and the number of premium channels to which the customer subscribes in the case of a business customer, you also need to know the number of basic service connections and the number of premium channels. Other data needed to calculate the bill, such as the bill processing fees and cost of a premium channel, are known quantities. The program should print the billing amount to two decimal places, which is standard for monetary amounts. Input: The customer’s account number, customer name, number of premium channels to which the user subscribes, and , in the case of business customers, the number of basic service connections. Output: Customer’s account number, customer name and the billing amount. The photos above were the output of this source code.